This year I decided to cut my Christmas baking way back!! Every January my freezer is full of Ziploc containers with cookies not yet eaten. But I still want some baking to bring to parties and family gatherings, to give away and for the kids to enjoy. 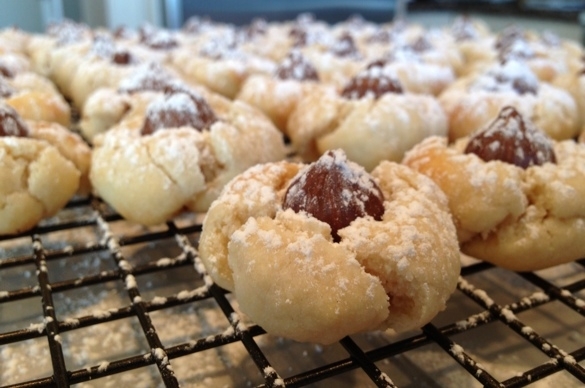 One cookie I knew I could not get away without making is my Christmas rose bud cookies. They are my kids’ favorite…and they are so simple and fast to make! I’ve tried a few different recipes and over the years and I’ve perfected my own….here it is! Cream together the butter, sugar and vanilla with a hand held mixer or KitchenAid. Add the flour and blend together well. Cover the dough with plastic wrap and chill for at least 1/2 hour. You can also chill overnight. 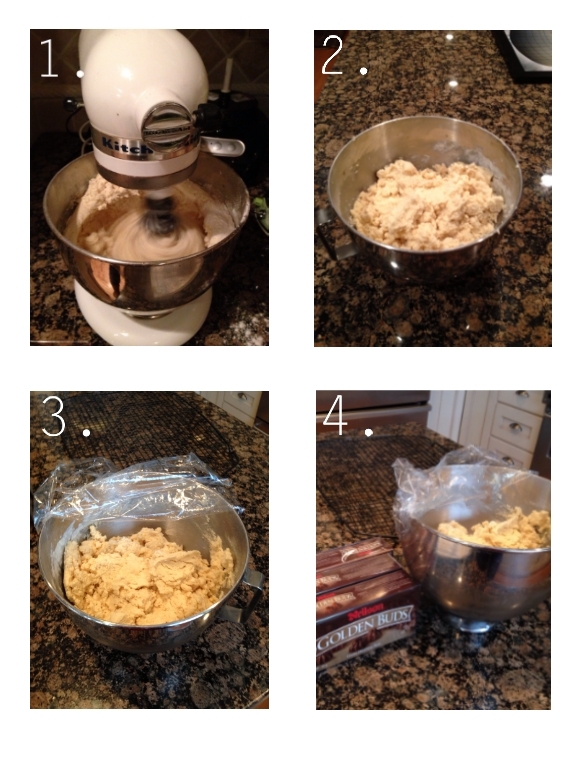 Shape the dough into balls using about 1 1/2 tablespoons of batter. 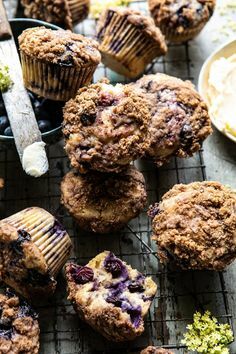 The batter will be crumbly, but keep working it into a ball with your hands. 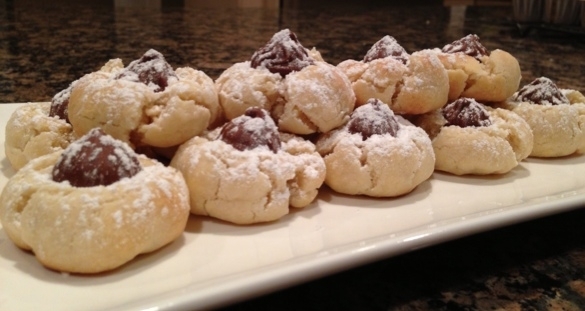 Place balls on a cookie sheet lined with parchment paper. Bake at 375 degrees for about 8 minutes turning the pan halfway through. 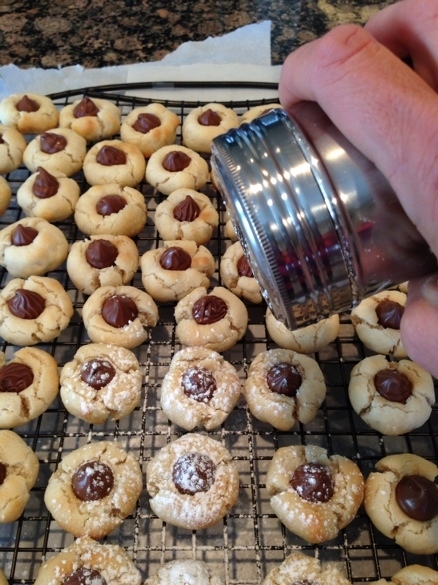 As soon as the cookies come out of the oven, push a rose bud into the center gently. The cookie will crack a bit (if it cracks too much and you are worried it may fall apart, push it together and it will solidify a bit as it cools). Move cookies to a cooling rack carefully as the rose buds will be soft. Once completely cooled, dust with powdered sugar. 4. Ready to start rolling! 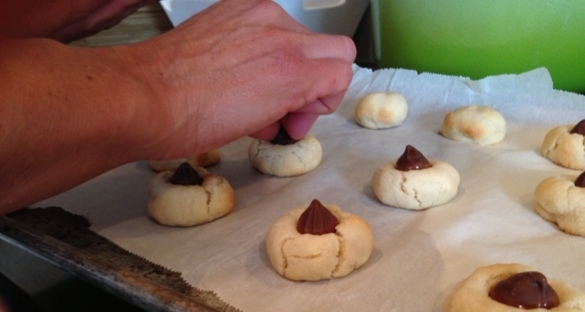 Push a rose bud into each cookies immediately when they come out of the oven. You can also use Hershey’s kisses if you prefer, however, I like how the ridges of the rose buds catch the icing sugar. Plus….if you are in a hurry, you don’t have to unwrap them! I put parchment paper under my cooling rack before dusting the cookies with icing sugar. This helps with clean up and saves you from sticky counters! I found this icing sugar duster as a restaurant supply store for a couple of dollars! Perfect to use for French toast too! So quick and easy and they freeze well. I put parchment paper between the layers when freezing them. Just don’t stack them until the rose buds have hardened!